Agilent Technologies Inc. (NYSE: A)has introduced the high-speed M9703A digitizer,the industry's first eight-channel, 12-bit digitizer that complies with the AXIe open standard. The AXIe digitizer isdesigned for use in large-scale applied physics applications. The M9703A digitizer is capable of usein large-scale system configurations that pack 40 channels within a single 4UAgilent M9505A AXIe chassis or 80 channels intojust 8U of rack-mount space giving it twice the channel density of comparablesolutions. This makes the new digitizer well-suited for challenging experimentsin particle physics, nuclear fusion, hydrodynamics and microwave radioastronomy. 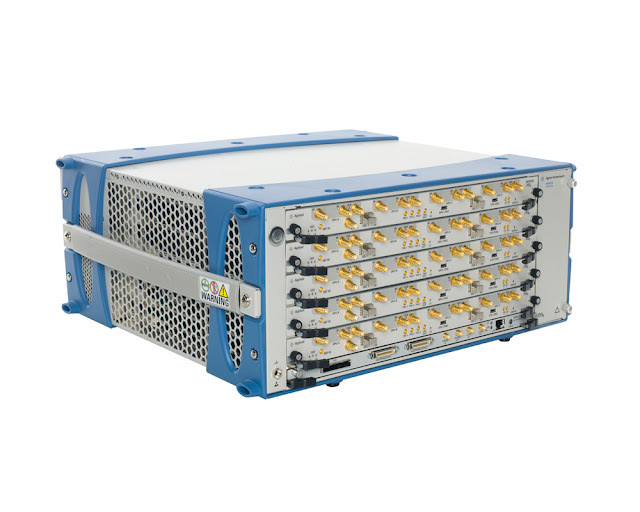 The M9703A is a single-slot AXIe modulewith four- or eight-channel acquisition capability running at 1 GSa/s to 3.2GSa/s. It can provide more than 1 GHz of instantaneous analog bandwidth. Thedigitizer also enables long acquisitions with its very large on-board memory ofup to 4 GB. To ensure high throughput, thedigitizer module provides a four-lane (x4) PCI Express Gen 2 backplane,enabling sustained data transfer rates of up to 1 GB/s. With four on-boardXilinx Virtex-6 FPGAs, the M9703A also optimizes measurement throughput andsupports future implementations of high-performance data processing. The M9703A digitizeris compliant with the AXIe and AdvancedTCA(r) standards.Designed to benefit from fast data interfaces, the module can be plugged intoAXIe or AdvancedTCA chassis slots. "This new AXIedigitizer drastically simplifies the creation of very densedata acquisition systems that include a large number of high-speed synchronouschannels with wide dynamic range," said Didier Lavanchy, Agilent'shigh-speed digitizer operation manager. "In advanced applications such ashigh-energy physics experiments, the M9703A provides excellent measurementfidelity from DC to 1 GHz with up to 9.4 effective bits, 66 dBc spurious-freedynamic range and 59 dB signal-to-noise ratio." The M9703A AXIe digitizer extendsAgilent's portfolio of AXIe based products, and high-speed digitizers modules, which alsoincludes solutions in the CompactPCI(r) format. To ease module integration intosystems containing Agilent CompactPCI digitizer modules, the M9703A includes acomprehensive set of module drivers and a soft-front-panel graphical interfacethat also support other Agilent high-speed digitizer products. The M9703A eight-channel, 12-bit, 1GSa/s to 3.2 GSa/s, digitizer is priced starting at $70,392 and orderable now.More information about product configuration and pricing is available at www.agilent.com/find/M9703A.High-resolution images are available at www.agilent.com/find/M9703A_images. AXIe is a standard based on AdvancedTCAwith extensions for instrumentation and test. The mission of the AXIeConsortium is to provide an open standard that creates a robust ecosystem ofcomponents, products and systems for general-purpose instrumentation andsemiconductor test. AXIe leverages existing standards from PXI, LXI and IVI.AXIe promises high scalability and performance that will address a range ofplatforms, including benchtop measurements, rack-and-stack modular, and ATEsystems. Additional details are available at www.axiestandard.org. Agilent Technologies Inc. (NYSE: A) isthe world's premier measurement company and a technology leader in chemicalanalysis, life sciences, electronics and communications. The company's 18,500employees serve customers in more than 100 countries. Agilent had net revenuesof $5.4 billion in fiscal 2010. Information about Agilent is available at www.agilent.com.